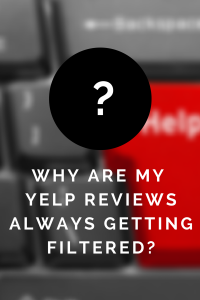 K-3 Technologies | Why Are My Yelp Reviews Always Getting Filtered? Trying to discover the algorithms for how your Yelp reviews are being filtered is similar to attempting to figure out Google’s methodology to SEO. Though not as complicated, no one actually knows the exact formula that Yelp uses when sorting out recent reviews and it’s undisclosed for a reason; to prevent spammers, false reviews, and fictitious claims. So although your business is protected from these nuisances, your newly applauded review may not reach the visibility you want and deserve. Through ongoing research, we’ve managed to discover some key factors weighing in on how and why your reviews are being filtered. One thing to remember is to not take it personal as every single review is subject to Yelp’s recommendation software, having nothing to do with your business itself. So why are some reviews more visible than others. One aspect is the total amount of reviews a given user has created in the past. These users are assumed to be more influential. Adding more to their credibility is the amount of friends and fellow Yelp users in their posse. Another determination is the length of the review. It’s easy for a bot to enter a simple “this places is the best” but a well thought out review shows that it is not automated or contrived. Similar to how social media works, the more active the user, the more engagement follows. Yelp’s filtering system factors user activity levels into the process as well. The most important element we have found to date is the age of the account the review has been derived from. Users that have been active for about five months or less, are almost always excluded from a company’s overall rating and are instead available via a link at the bottom of the business’s profile page. Yelp’s recommendation software is automated and the rules change regularly, however the aforementioned factors have always been considered. If you’re in need of an Atlanta digital marketing agency to help boost your company’s visibility, then contact us today. We are eager to impart knowledge and contribute to your growth!